In The Prince Niccolò Machiavelli shrewdly outlines the strategies that a ruler must follow to maintain his position and govern his state. With a clear and direct authorial voice, Machiavelli employs ancient and contemporary examples to illustrate the pragmatic tactics of successful leaders. Dedicating his book to the Florentine ruler Lorenzo dé Medici, Machiavelli draws heavily on his own political experience to support his exceedingly realistic views on human nature and the techniques of able rulers. Contradicting conventional morality, Machiavelli advises wise princes to use violence and cunning to safeguard their states. The Prince explores the careful balance between contrasts, comparing virtue and vice, prowess and fortune, and subjects and rulers. At the start of the treatise Machiavelli asks Lorenzo to accept The Prince as a "token of my devotion," stating that his "long acquaintance" with political affairs and "continuous study of the ancient world" inform his writing. In the first chapters Machiavelli outlines the scope of The Prince, declaring his focus on the various types of princes and principalities. Arguing that new principalities pose greater difficulties than hereditary states, Machiavelli segues into a discussion of composite principalities, in which new states form an "appendage to an old state." Within this context, Machiavelli raises the guiding principals of The Prince, encouraging rulers to cultivate the "goodwill" of the people and to study the art of warfare. Machiavelli urges princes to approach political disorders like "a wasting disease," taking care to diagnose and treat them quickly and resolutely. Citing Cyrus and Romulus, Machiavelli turns to a discussion of prowess, imploring "prudent" rulers to follow the examples of "great men." Machiavelli writes that men who become rulers by prowess "gain their principalities with difficulty but hold them with ease." Conversely, those who gain power through fortune become rulers easily but maintain their position "only by considerable exertion." Naming Cesare Borgia as a contemporary ruler who gained his status through fortune, Machiavelli praises the "strong foundations" that Borgia laid for his future but laments "the extraordinary and inordinate malice of fortune" that eventually ruined the unlucky duke. Machiavelli declares that every stable state shares the same foundations, "good laws and good arms." However, Machiavelli places an emphasis on good arms, explaining that good laws "inevitably follow" from military might. Machiavelli warns rulers to avoid the use of mercenary and auxiliary troops, on which he blames "the present ruin of Italy" and the earlier downfall of the Roman Empire. According to Machiavelli, "The first way to lose your state is to neglect the art of war," and he encourages princes to study warfare in peacetime so that they may "reap the profit in times of adversity." While laying out his guidelines for a prince's moral conduct, Machiavelli blurs the traditional border between virtue and vice. Machiavelli argues that a prince must adhere to a unique standard of morality, often acting "in defiance of good faith, of charity, of kindness, [and] of religion" in order to safeguard his state. The challenges of governance require rulers to reverse the general relationship between virtues and vices, although Machiavelli encourages clever princes to maintain the appearance of virtue. On the question of "whether it is better to be loved than feared," Machiavelli asserts that it is preferable to be feared if the prince cannot "be both the one and the other." Above all else, a prince must "escape being hated" by his people, which he can accomplish if he does not rob his subjects of their property. Machiavelli urges rulers to maintain a "flexible disposition," mimicking the behavior of the fox and the lion to secure their position. Addressing the distinction between prowess and fortune, Machiavelli contends that fortune controls half of human affairs, leaving the other half to free will. Machiavelli advises princes to "take precautions" against the "malice of fortune," using prowess to prepare for unpredictability. Turning to contemporary Italy, Machiavelli blames the weakness of its states on the political shortcomings of its rulers. Machiavelli concludes by imploring Lorenzo to use the lessons of The Prince to unify war-torn Italy and thus reclaim the grandeur of Ancient Rome. Jumper, Alexandra. "The Prince Plot Summary." LitCharts. LitCharts LLC, 5 Jan 2014. Web. 22 Apr 2019. Jumper, Alexandra. "The Prince Plot Summary." LitCharts LLC, January 5, 2014. 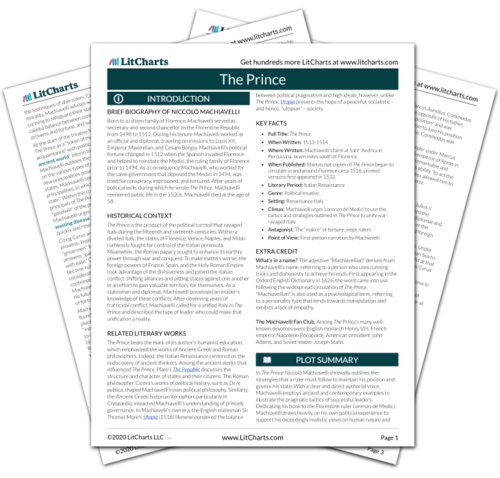 Retrieved April 22, 2019. https://www.litcharts.com/lit/the-prince/summary.